When a soul, sinful but talented and longing for epiphany, encounters genuine holiness, a “divine spark” produced by this encounter kindles an unquenchable flame of creativity. 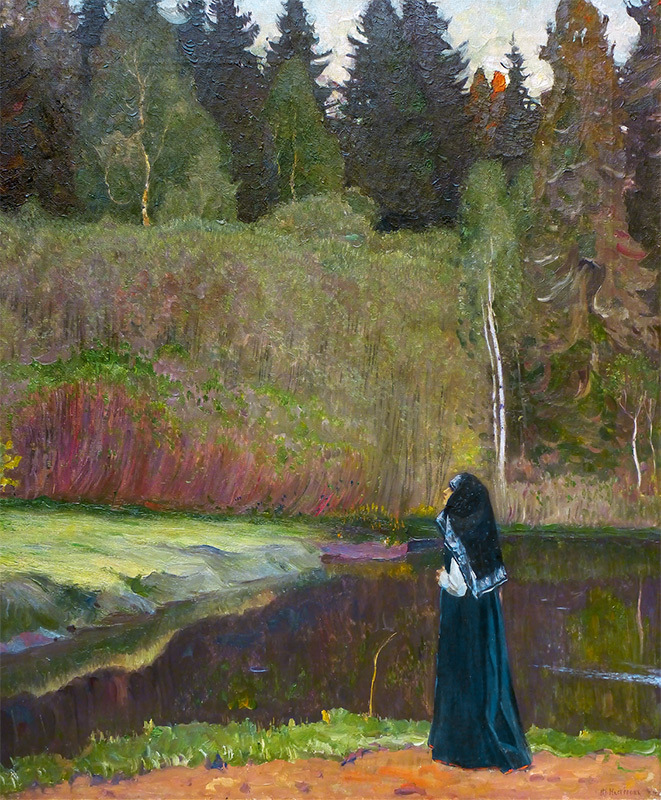 For Mikhail Nesterov, “holiness” was a hallmark of the ideas and objects regarded as sacred by every nation: the lands of the forbears, religion, the history and heroes of the country. But, together with his deep “affection for one’s hearth and home, affection for one’s ancestral tombstones,” he equally revered the title of artist, questioning, until his last days, his right to be called one. This personal modesty, combined with an unsparingly demanding attitude towards himself, appears to have left a mark on everything that Nesterov loved and reflected upon in his artwork. His compositions enthral the viewer with the modest charm of Russia's heartland scenery and a sense of serene sadness, calm and quiet. The individuals who look back at the viewer from Nesterov's portraits are educated and energetic people who are aware of their mission in this world and play their part with dignity, but without any publicity or noisy fight for their place on earth. The young Nesterov discovered that the personality and life story of St. Sergius of Radonezh - the great Orthodox ascetic, the founder of the Holy Trinity-St. Sergius Lavra (monastery) and, in the artist's words, "the best man of old Rus"1 - personified the philosophy of life to which the artist subscribed. 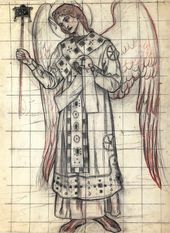 From then on thoughts about St. Sergius would haunt the artist, both inspiring him in the joy of creative work and keeping his spirit up during his difficult years of involuntary seclusion. "The Vision of the Young Bartholomew" (18891890, Tretyakov Gallery) is Nesterov's key work. He spoke about it in almost categorical terms: "He to whom this painting says nothing does not need Nesterov in his entirety. 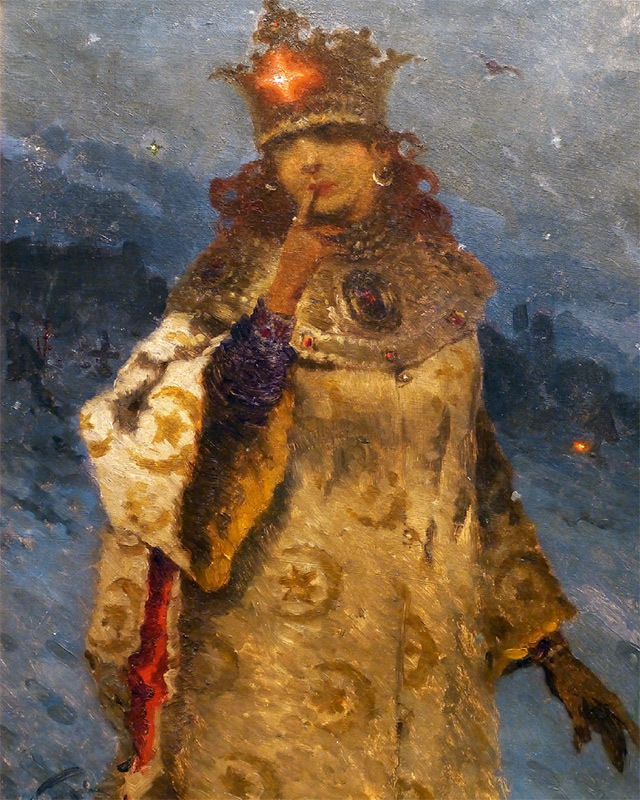 "2 Indeed, "Bartholomew" is the epitome of the artistic credo of the painter who combined the Golden and Silver Ages of Russian culture, a deep engagement with ideas and a hunger for beauty, and the search for an original artistic idiom and integration into the general European romantic tradition. Characteristically, the vibrant image of young Bartholomew, the future St. Sergius, was inspired not so much by the somewhat dry language of St. Sergius's hagiography written by Epiphanius the Wise as by Jules Bastien-Lepage's composition "Jeanne d'Arc" which Nesterov saw at the Exposition Universelle in Paris. The young Russian traveller, sitting in front of the painting for hours, "was feeling like I was in love," as he described the experience3. But the painting's artistic qualities alone would not have sufficed to inspire such admiration. Nesterov, who was even then convinced that art should include a strain of patriotism, summed up the reason for his admiration: Bastien-Lepage with his picture "sincerely talked about his love for his homeland"4. But Russia was not Nesterov's only "home". Following Fyodor Dostoevsky, whom he respected so much, he could have repeated that writer's words: "We, Russians, have two home countries: our Rus' and Europe, even when we are called Slavophiles. "5 Italy cast a life-long spell on the artist: "Every time I recall Italy, my heart is filled with balm. "6 And he wrote about Rome: "Every time the same resurgence of the familiar sense of bliss. "7 The style of Nesterov's religious art, sometimes so "Russian" in its imagery and mood, bears a very strong imprint of this "Italian captivity". Even St. Sergius in "The Youth of St. Sergius" (1892-1897) is full of some "Florentine" elegance, as a result of which, it is said, Emperor Alexander III, visiting an exhibition of the "Peredvizhniki" (Wanderers) group, at first glance mistook the Russian saint for Francis of Assisi8. Yet it was the "miserable, grey, but heart-wrench- ingly dear"9 Russia that the artist loved most of all: Russia's history, people and destiny were the lynchpin of his art. At the same time, Nesterov the artist was not very much interested in momentous events or remarkable personalities. 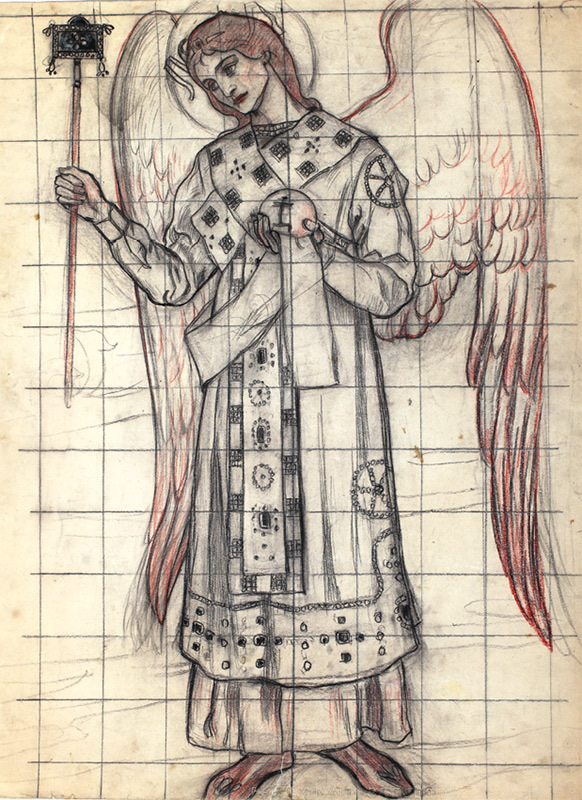 His interest usually vanished at the sketching stage, but St. Sergius of Radonezh was an exception. The artist, like Pushkin and Dostoevsky, was guided by a conviction that the most important developments in history were not those that accompanied war but the very slow, difficult, barely perceptible changes that occur in the morals of individuals and entire nations eager to come closer to Christ. Such changes are a fruit of calm reflection and prayerful concentration. Thus, Nesterov placed his heroes in environments conducive to meditation. Humble monks and sad damsels, refined philosophers and the crowd heavily tramping the Volga banks - all exist within an unostentatious but deeply charming "Nesterov" landscape. 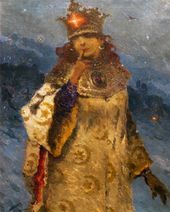 Against this background, the artist said, "One grasps more clearly both the essence of Russian life and the Russian soul. "10 For Nesterov, nature is like God's temple - the human being is not to change it. Quite the opposite, nature produces a miraculous and transformative effect on human beings, helping them to acquire inner perfection. The Bolshevik revolution was for Nesterov tantamount to the victory of the enemy. Old Russia was irrevocably transformed into the mythical city of Kitezh - a holy symbol, and the artist remained its singer, remembering what Vasily Rozanov, the theologian and philosopher, had told him: "You're a fighter who rows against the stream..."11 In the early 1920s Nesterov created a series of "wayfarer" paintings ("Wayfarer", 1921. Tver Regional Art Gallery; "Wayfarers. Beyond the Volga", 1922. Belarus National Arts Museum; "On the Volga", 1923. Private collection). 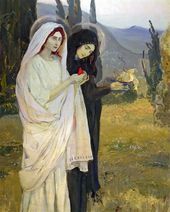 No longer featuring crowds of people, who were now in thrall to propaganda, the compositions, infused like Nesterov's previous pieces with a subtle lyricism of religious feeling, were focused on individuals in search of Christ. Nesterov addressed the theme of St. Sergius again: the young Bartholomew blessed by Christ ("Christ Blessing the Young Bartholomew". 1924. 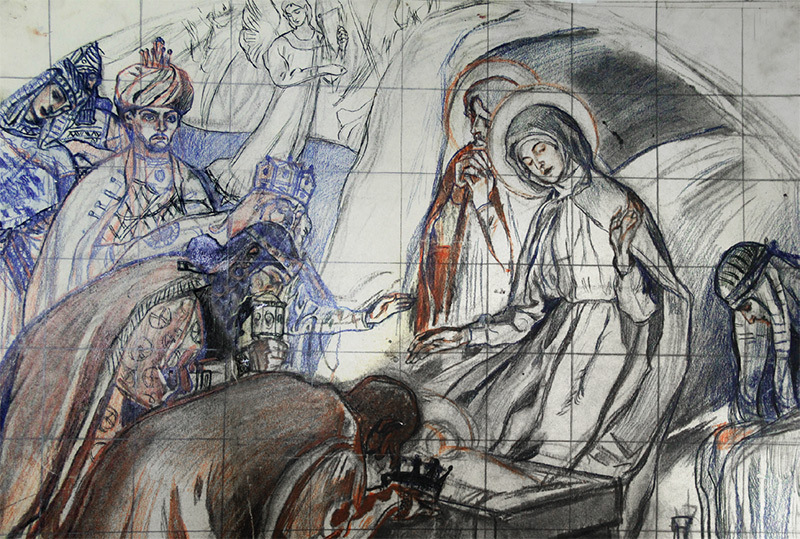 Moscow Theological Academy Museum of Religion12), and Alexander Peresvet with Rodion Oslyabya, sent by St. Sergius to help Dmitry Donskoi ("Peresvet and Oslyabya", 1923 (?). Private collection), the monks riding horses, the saint's disciples galloping from the monastery attacked by the Poles to Moscow, to pray in front of the holy relics ("Horse Riders", 1932. Moscow Theological Academy Museum of Religion), and finally, the landscapes painted near the Holy Trinity-St. Sergius Lavra - all these narratives are infused with ideas of salvation, struggle and hope. 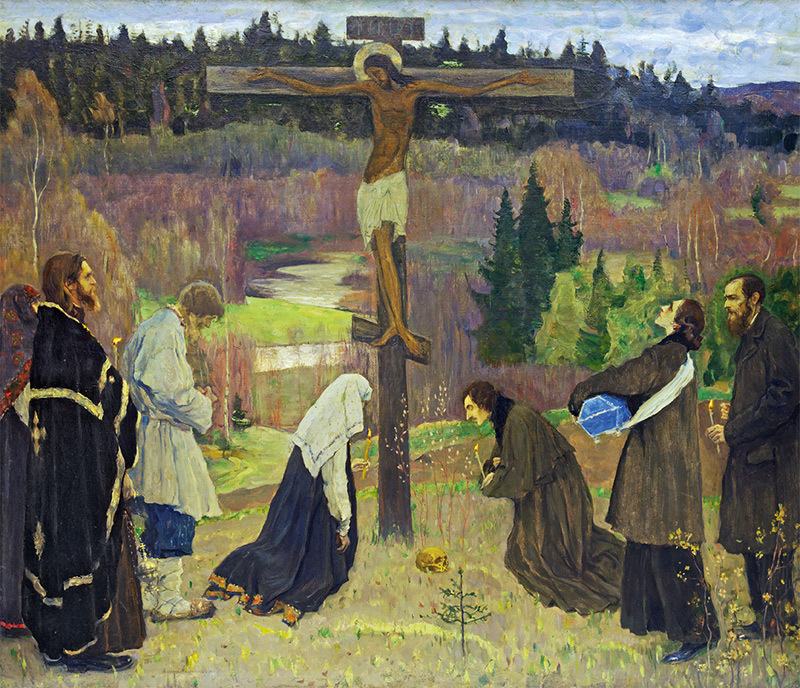 Trying to sum up his reflections about the catastrophe that had befallen Russia, Nesterov worked for nearly 15 years in secret on "Holy Week" (1933, Moscow Theological Academy Museum of Religion) - a painted mystery play, a painting of repentance, which he hid from everyone. This composition possesses symbolical significance: the clergy, the intelligentsia, the ordinary people - all of them, the artist believed, bore their share of responsibility for what had happened to the country. But a genuine awareness of one's sins, in front of the Crucifix and against the background of vernal nature, gives hope for future rebirth. In the 1920s-1930s and later, Nesterov's works held an appeal for Russian emigres with their nostalgia, as well as for those from academic and artistic circles who were brought up on the values of pre-revolutionary Russia. These were the people whom the artist continued to address in his works, in spite of reviewers' dangerous insinuations that he was not satisfactorily helping to build the socialist state. While, from the mid- 1930s, the large Soviet museums were eagerly acquiring Nesterov's brilliant portraits, his religious-poetic, nostalgia-soaked works, and numerous sketches and studies, found a ready home with private collectors. His heirs continued to hold large collections of his art. Soon after the death of the artist, who had won official recognition by the end of his life, the first exhibition of his works from private collections took place, and until the early 1960s such shows were held regularly. Since then many of his works have changed hands and become part of museum collections, and a number of excellent compositions were brought back to Russia from abroad. At the Mikhail Nesterov's Visions exhibition at the MacDougall Gallery dedicated to the 700th anniversary of Sergius of Radonezh visitors could enjoy the painter's works from two of the most important contemporary private collections of Nesterov's art, that of his granddaughter Maria Titova and that of Nikita Mishin. Such especially noteworthy pieces include Nesterov's early "Self-portrait" (1882); the elegant composition in Pre-Raphaelite style, "Myrrh-bearing Women" (1901); versions of the famous landscapes "Aksakov's Homeland" (1910) and "A Nightingale Singing" (1918); compositions combining the qualities of genre piece and landscapes, such as "An Abandoned One" (1923) and "Women Rivals (By the Lake)" (1921 (1924? )); and finally, the unique "Head of St. Varvara" (1895-1897; 1924) - a fragment of the piece called "The Miracle", which in 1900 won the artist a silver medal at the Exposition Universelle in Paris and was reworked, and later destroyed, by Nesterov. 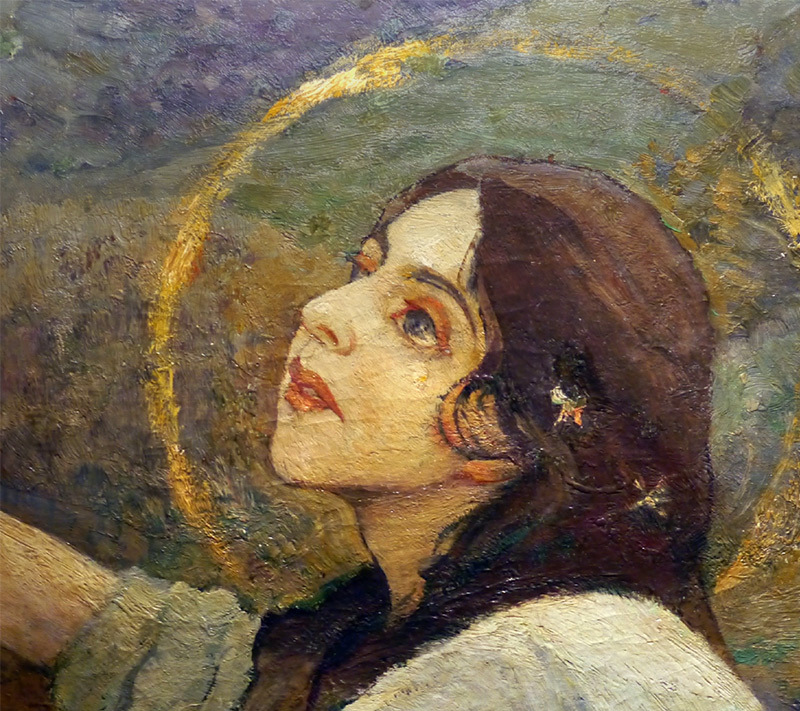 A special section of the exhibition was dedicated to Nesterov's works from the collection of the Moscow Theological Academy's Museum of Religion (Holy Trinity-St. Sergius Lavra), including "Holy Week" (1933), "Horse-riders" (1932) and "Brooding Thoughts (Portrait of Sergei Durylin)" (1926). (Many visitors had already had the chance to enjoy these pieces at the recent Nesterov shows at the Russian Museum (2012) and the Tretyakov Gallery (2013), as well as at the permanent display of the Moscow Theological Academy's Museum of Religion.) 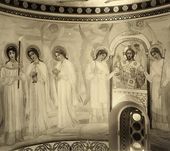 But what came as a real discovery to art aficionados were Nesterov's sketches for murals at the St. Alexander Nevsky Church in Abastumani in Southern Georgia, held at the Moscow Theological Academy's Museum of Religion. These large drawings, made mostly with graphite and coloured crayons in the early 1900s, had never previously been displayed. 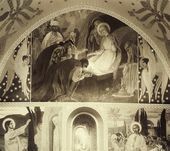 On the one hand, they show Nesterov's skill as a graphic artist with a perfect command of the academic style of painting, and on the other, signal his efforts to work out an organic "new style" combination of the Russian and European classical traditions, typical for Nesterov's murals. The show at the MacDougall Gallery13 was dedicated to the 700th anniversary of St. Sergius of Radon- ezh. Given this, its centrepiece was "The Vision of the Youth Bartholomew", a work from a private collection, created by Nesterov in 1917 - a tragic year for Russia. 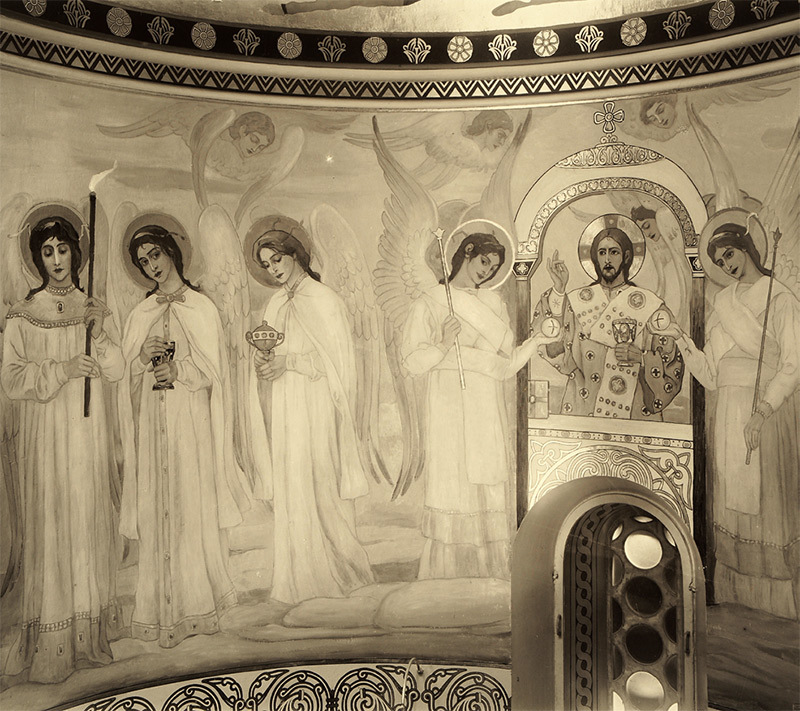 At that time the artist, as he had in his youth, was once again working much at Abramtsevo and around the Holy Trinity-St. Sergius Lavra, as if he was reviewing his past creative accomplishments on the threshold of the new era. Nesterov completely re-conceptualized the old composition with the well known figures of the youth and the old man, lending it what may be called dramatic overtones. In the new version, Bartholomew, lectured by the mysterious monk, looks into the autumnal expanses not only with hope, but with anxiety as well, anticipating the forthcoming ordeals. It may be opportune to recall that Nesterov's first solo show was held in St. Petersburg and Moscow in 1907, when memories of the military defeat suffered in the war with Japan were still fresh and the first Russian revolution was in full swing. The artist believed that the exhibition "due to the choice of pictures on display... brought some peace of mind to a society stirred up by recent events. "14 Today once again, at a similarly appropriate time, Nesterov tries to sensitize viewers to his simple truths with a low voice: isolate yourself from the noises of outside, fill your soul with love, cleanse your mind with prayerful silence - and the world, together with you, will become better. Quoted from: Durylin, Sergei. "Nesterov in Life and Art". Moscow, Molodaya Gvardia: 1976. P 172. "Mikhail Nesterov. Letters. Selections". 2nd edition, revised and enlarged. Prefaced, compiled and annotated by A. Rusakova. Iskusstvo, Leningrad: 1988. P 58. Dostoevsky, Fyodor. "Complete Works". 30 volumes. Vol. 23. Leningrad, Nauka: 1981. P 30. "Mikhail Nesterov. Letters". P 367. Nesterov, Mikhail. "A Memoir". Prepared for publication and prefaced by A. Rusakova. Moscow, Sovetsky Khudozhnik: 1989. P 354. Hereinafter - Memoir. "Mikhail Nesterov. Letters". P 262. Department of Manuscripts, Russian Museum. Item 19, sheet 16, year 1907. Moscow Theological Academy's Museum of Religion, Sergiyev Posad. The exhibition took place in November 2014 at MacDougall Gallery, Moscow, Yermolaevsky per., 25.